Great surprise this morning when I launched Xiti (yes, everyone still calls it Xiti) on a different browser than I usually do. There’s an ad for their iPhone app on the login page. Looks like it’s been out for a while but since I’m automatically logged in with my other browser I had never seen the news. The app looks great so far. You can only access websites with an Analyzer NX subscription but if you don’t have one, I guess you don’t need to access your stats on your mobile. An iPhone app was definitely a feature that was missing. 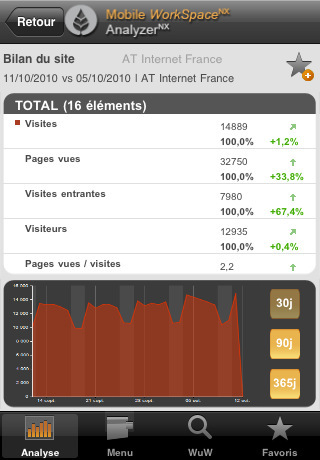 I’ve used apps for Webtrends (official) & Google analytics (not official). I’ve checked and there’s also one for SiteCatalyst and one for coremetrics. It seems most of the web analytics platform have an iPhone app now. As far as the iPad is concerned, the Analyzer NX app does not have a specific iPad version but you can use the normal version in Safari on your iPad, I’ve never encountered any problems.